Creating a new Skype meeting by a user homed on a SfB on-prem pool, creates a duplicate entry for the dial-in conferencing number. 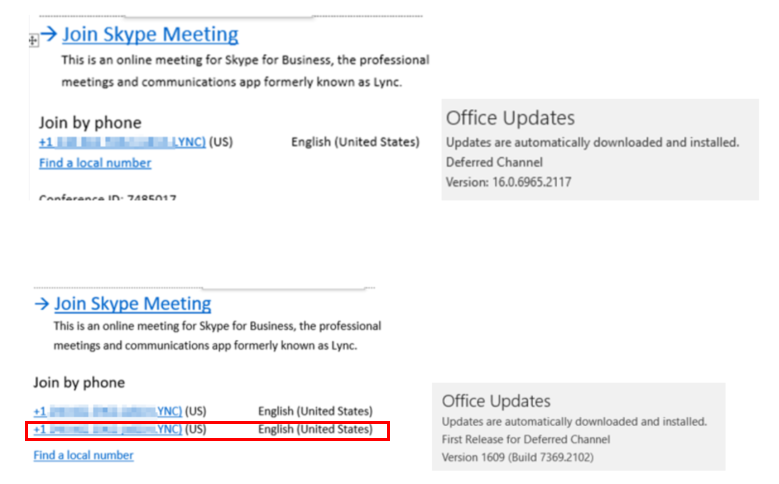 The same version works fine for users homed on Skype Online though. Seems to be happening in the latest release of Office 2016 C2R update - First Release for Deferred Channel (1609 Build 7369.2102) that was released on Jan 10th. Probably a bug. Have a ticket open with support to find out. On-prem SfB servers are not at the latest Feb 2017 level, so perhaps there is a fix for this in there. Is anybody else also seeing this?